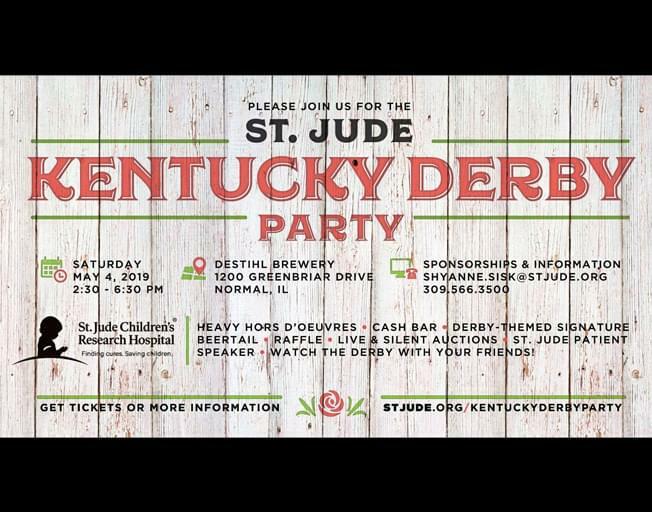 Help the children at St. Jude Children’s Research Hospital and join B104 Saturday, May 4th at Destihl Brewery on Greenbriar Drive in Normal for St. Jude’s inaugural Kentucky Derby Party. The party is from 2:30 pm – 6:30 pm. Watch the 145th Kentucky Derby while enjoying heavy hors d’oeuvres, themed cocktails, a cash bar, bidding on exclusive auction items and trying your luck at the raffle! Also during the party, there will be a special patient speaker. You DO NOT want to miss that! Tickets are $75 and can be purchased here! All the proceeds from the event will further the life saving mission of St. Jude: Finding Curses. Saving Children.